XpertHR’s HR and Employment Law Basics for Small Business provides 12-month access to award-winning, authoritative, practical and continuously updated federal, state and select municipal HR and employment law compliance resources tailored to the needs of the HR professional. This easy-to-use web-based service empowers your compliance efforts, saves time and money by reducing risk and increases productivity and efficiency within your organization. Topical news articles, extensive FAQs and a robust employment law glossary. Organizational exit, including involuntary and voluntary terminations. Once purchased, instructions for HR and Employment Law Basics for Small Business web access will be emailed to you from the following address: XpertHRcare@xperthr.com. Please check your spam filter if you do not receive the login details within 24 hours of ordering. Interested in additional states? Three state and five state bundles are available through the SHRMStore. Email SHRMStore@shrm.org for more information. Interested parties may email SHRMStore@xperthr.com for access to more than five states, multiple users/team licenses and to learn more about the entire portfolio of XpertHR resources and the 50-state survey quick reference charts, how-to and best practice guides, customizable training content and XpertHR’s international coverage proving authoritative HR and employment law guidance for more than 40 countries. 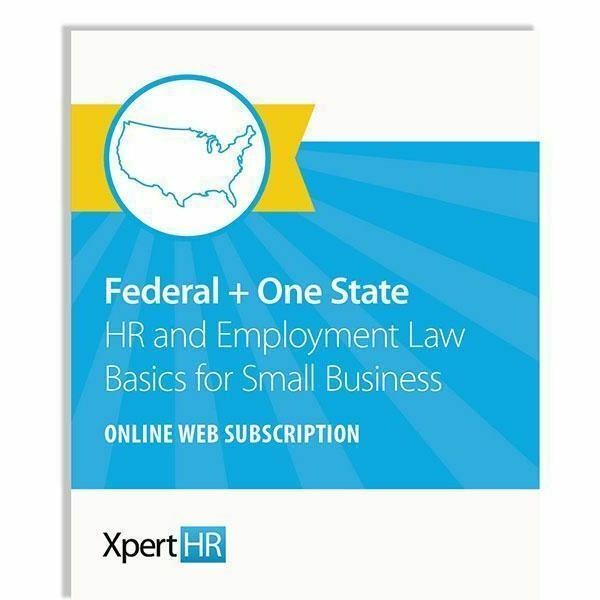 These resources are not included in an HR and Employment Law Basics for Small Business subscription but can be purchased directly through XpertHR by emailing SHRMStore@xpertHR.com. Use of HR and Employment Law Basics for Small Business is subject to XpertHR's website terms and conditions. Should you wish to discuss usage not currently contemplated by these terms, please email SHRMStore@shrm.org.